Since its introduction in the early fifties, the legendary 250 GT had only received Coupe or Berlinetta bodies. It was Boano who first introduced a Spyder in 1956. One year later, at the Geneva Motor Show, a masterly inspired Pinin Farina at the top of his art replied with a striking design, built on the long wheelbase chassis (2,600 mm) powered by the famous 3-liter V12 engine. Three more “speciale” bodies followed before a small series of 36 cars went into production between 1957 and 1959. Although the general lines remained unchanged, nearly every car differed in some small detail, allowing for individual requests. The example pictured here has the very desirable covered headlights, small rear lights and also features side vents. The later cars sported open headlights and also larger vertical taillights, announcing the “Series 2” cabriolet. 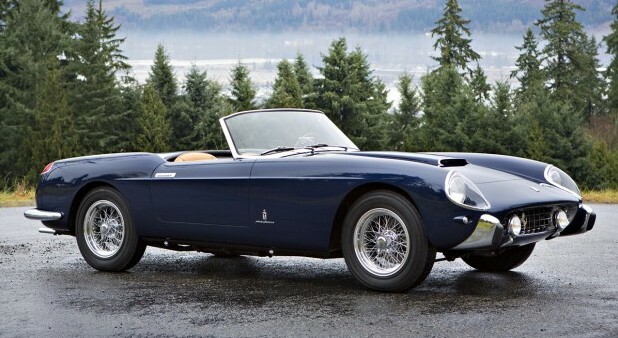 The small series was discontinued when it became obvious that the model was similar to the Spyder California, which was assembled by Scagliette, this being significantly less expensive for Ferrari. The Pinin Farina cabriolet was made in fewer numbers, was extremely pretty and was certainly more refined and better built than the California. Its real value is now recognized among collectors and enthusiasts throughout the world. 0979 GT was delivered on 21st June, 1958 to Count Portanova in Italy in red with a black leather interior and it remains in this color scheme today. At some point during its early life the less efficient drum brakes were replaced by discs and the car was exported to the United States before returning to Europe in the late eighties. Unfortunately, the French enthusiast who had purchased it passed away shortly after the car returned to Europe and his executors have kept it in storage until now. On a short test drive the car appeared to be in good running condition. Cosmetically, the car appears to be in very good condition, having been resprayed and re-upholstered about eight years ago and barely used since.